When evaluating products it's important to take a holistic approach and consider all factors before making a decision. Often one product is promoted as "cheaper" and presented in a way that tactfully ignores certain key functions and benefits. With the recent entrance of USG Ensemble in the acoustical plaster marketplace, this article covers some of the key differences as it relates to the system as a whole. Fellert achieves significantly higher sound absorption and light reflection than USG Ensemble. *Sources listed below. Verify with Manufacturer. The difference between USG Ensemble and Fellert Silk in terms of finish is dramatic. The Fellert is similar to drywall, while the USG is more reminiscent of a popcorn, parking garage ceiling. The number one misconception that is being spread is that USG Ensemble is cheaper than all other acoustical plaster systems. While this may be true as an upfront cost, total cost over time and with repairs makes this a null point. During the life of the ceiling there are many other unknowns and events that can go wrong. An air-vent can cause streaking, or new lights be added to the ceiling. Recently we encountered this problem at the Chihuly Center Museum in Kansas. The Fellert ceiling was installed in 2017, however the art exhibition was changed in 2018 and required new lighting to be installed in the ceiling. 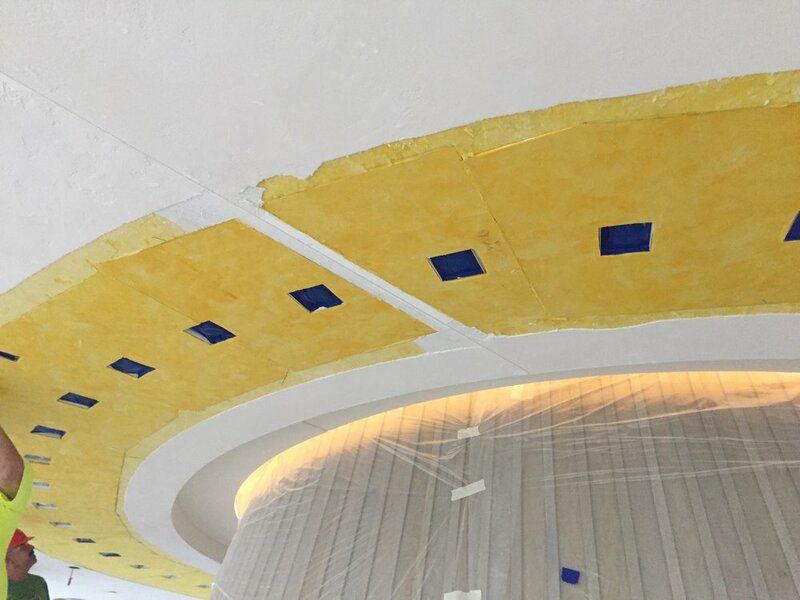 Fellert is the only acoustical plaster system that can be patch repaired without replacing the entire ceiling. This represents significant cost savings for the owner over time. If cost savings are required, Fellert has several tactics that can be used to reduce the total installed price of the system. Contact 888-692-7377 to learn more. New penetrations cut out in the Fellert ceiling. New acoustical board is cut to fit into the gaps. Fellert basecoat is applied to the fiberglass. Finished ceiling - after patch repair is completed. Fellert provides a standard 5 year warranty versus the USG Ensemble 1 year warranty. The difference in warranty is likely due to Fellert being an established and well tested system that the company stands behind, while USG is still being developed as a new product. As mentioned earlier, Fellert is the only system that can be patch repaired with ease. In addition, Fellert can be completely re-coated up to 4 times before lowing the NRC performance. This has been significant in areas where an air vent creates unwanted staining, or if there is a water leak in three years and you want to make the whole ceiling look new again without paying to have everything ripped out and reinstalled. Fellert can create curves and shapes while USG cannot. Fellert is also the only manufacturer that doesn’t technically need control joints. This is because they use a slightly more elastic, cotton-based coating as opposed to crushed marble aggregate or USG’s synthetic polystyrene aggregate. Fellert applied onto a contoured surface at KPMG. Fellert Acoustical Plaster can appear like stone, marble, or concrete in addition to the monolithic white finish. They are currently the only manufacturer that can create these finishes. For more information regarding acoustical plaster, reach out and speak with an expert today.